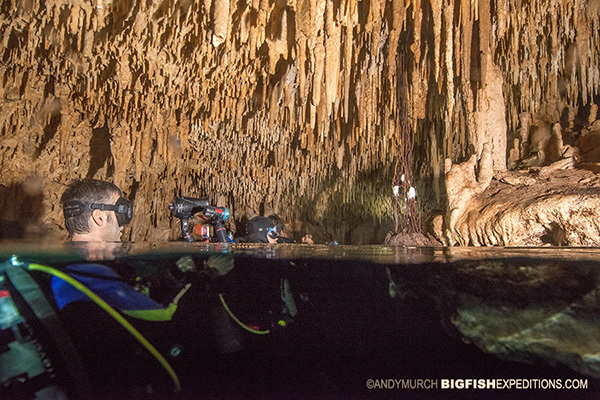 This year’s trip at a glance: we snorkeled with sailfish and dove in some beautiful cenotes when the wind howled. 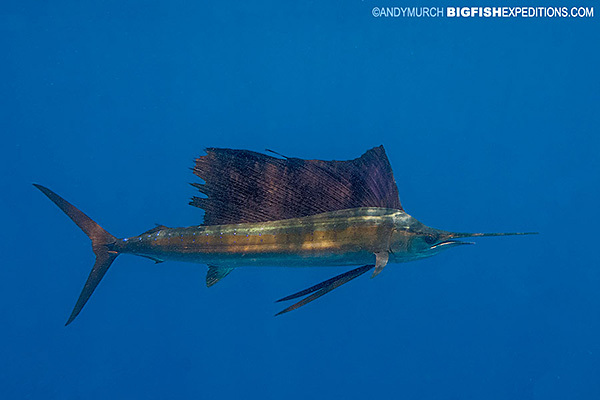 As usual, Mexico’s windy winter weather played havoc with our plans to chase sailfish everyday but fortunately, half of the time we did make it out and the birds and sailfish were waiting! Sailfish diving is never an easy proposition. 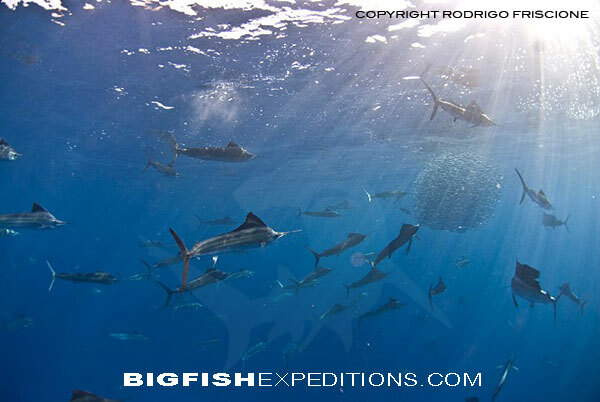 Firstly you need calm winds to be able to reach the area where the sailfish hunt sardines. Then you need frigate birds. The birds lead you to the bait balls that only they can see from their high vantage. If the surface is choppy or if its raining heavily the birds stay home and then there is no way to find the action. If the environmental conditions are perfect you still need the right predators. Often you’ll find frigate birds circling and scooping up fish but when you reach them, it turns out that they are following dolphins attacking sardines. Dolphins are messy eaters. 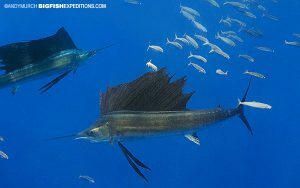 They have a nasty habit of driving off the sailfish and then breaking up their nicely formed bait ball. They don’t interact well with divers in that scenario so when you see dolphins its time to move on. Fortunately, on this occasion, the winds abated, the rain stopped, the frigate birds flew, the dolphins stayed away and the sailfish pinned enough hapless sardines against the surface to create a spectacle not to be missed. 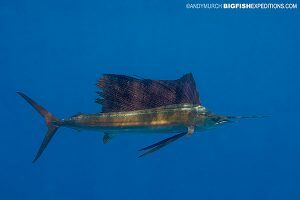 By the end of the the third day, everyone on the trip had hunting sailfish fixed in their memories and we were ready to spend our last windswept day, deep in the Yucatan forest diving in Cenotes. We visited three different cave systems on our two windy days. 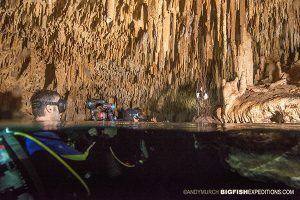 The first was Chakmool — a large multi-room cavern with pockets of cascading stalactites that left our divers awed. On our final day, we dove Angelita Cenote and then Car Wash Cenote. 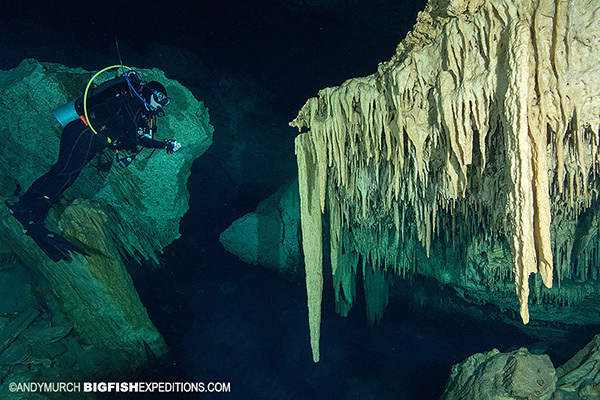 Angelita is a 50m deep cavern with sheer rock walls that plummet downwards into a layer of hydrogen sulfate. It’s a very eerie feeling as you descend into the milky hydrogen sulfate layer at 30m only to reappear in the darkened world a few meter below it. After a quick lunch we headed to Carwash Cenote. Here the cavern does not go very deep before reaching an ominous skull sign warning divers to turn back unless cave certified. 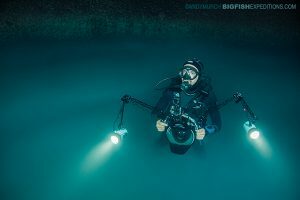 The reason to dive this particular cenote is to enjoy the life and colour at its main entrance. 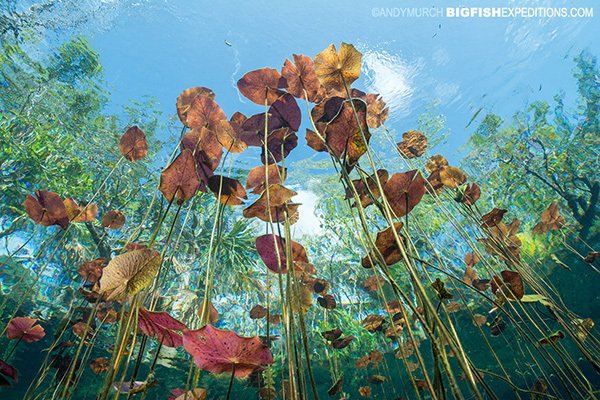 Where most cenotes are barren moonscapes, Carwash is filled with beautiful lilies and thousands of tiny freshwater fishes. 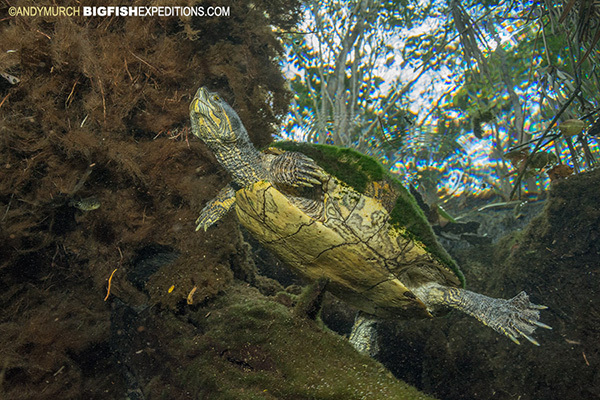 Turtles are also common and lucky divers may even find an illusive morolet’s crocodile. The cenote diving was so much fun that even if the weather is good everyday, I’m considering making the cenotes a permanent part of this trip in future years.